After uploading your file, if you selected a premium package you can then select how you want bank account types to appear in Xero. In your file bank accounts will be set as either bank, credit card, asset or liability accounts. 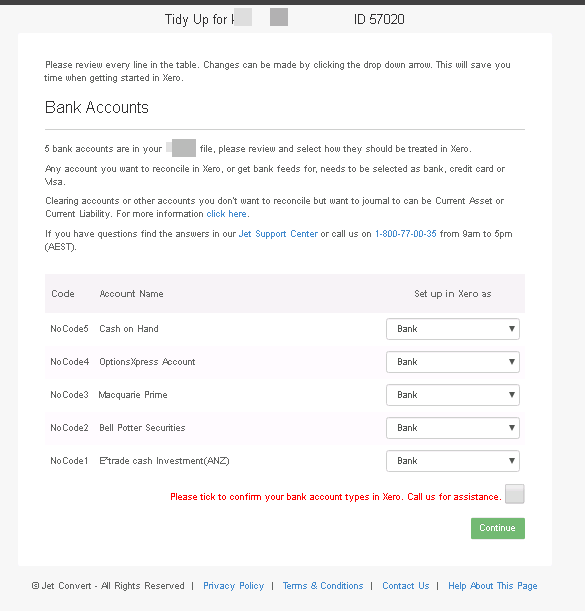 We recommend that any accounts that require bank feeds or reconciliation should be set up as bank accounts or credit cards and all other accounts be changed to an asset or liability account. This is because you cannot create manual journals to bank accounts in Xero. If you have had to change bank account type in Xero you will appreciate how much of a time saver it is to be able to choose the appropriate type upfront, prior to starting the conversion. Where do the Bank Account Mapping Defaults come from? To help you get the selection right, we create some smart defaults. Any bank account or credit card identified in the source system is shown in one of two lists. At the top, we show all bank/credit card accounts that had been reconciled in the source file. You can see the reconcile date to make it easier to see whether they are still relevant. Any asset accounts a preset to Bank, the Liability accounts to Credit Cards. The second list shows all other bank accounts that have not been reconciled (or not reconciled after the conversion date). These are normally more useful to be imported as Current Assets or Current Liabilities and default to these choices. They are still coming across with the ability to pay invoices/bills from them. Can I change account types myself in Xero? We’d love to hear your feedback on this feature, and anything else that you’d like to see as part of our service. Post a comment below!